Wisconsin growers produced between 5.85 and 5.9 million barrels of cranberries in 2016, according the Wisconsin State Cranberry Growers Association. That harvest would come close to a record they set in 2013 with a crop of more than 6 million barrels - about 6 million pounds, as a barrel equals about 100 pounds of fruit. A U.S. Department of Agriculture estimate in August 2016 forecast production closer to 5.2 million barrels for the year, but growers look to have exceeded this estimate. In any case, no state challenges Wisconsin's dominance in United States cranberry production - its nearest competitor, Massachusetts, produces less than half as much. Amid this bumper crop, the global cranberry supply is headed for a glut, thanks in part to Canada's growing cranberry industry. 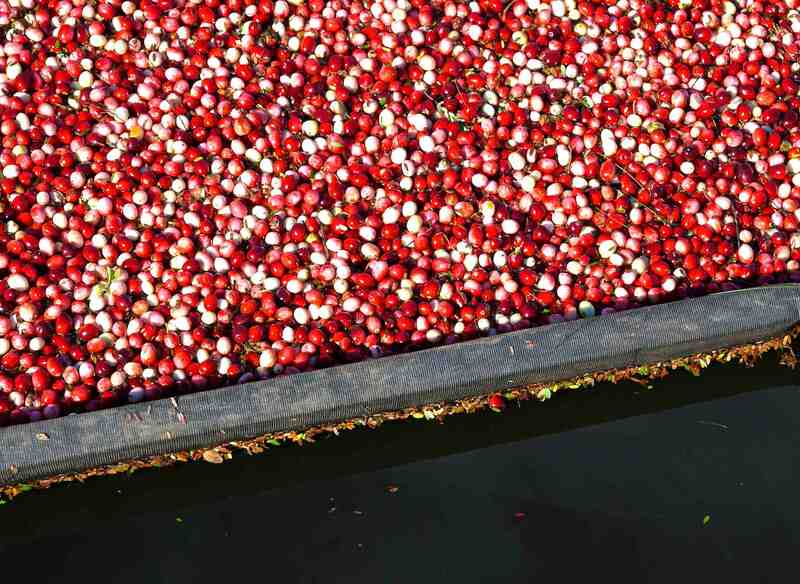 Late in 2016, the "Congressional Cranberry Caucus" asked the USDA to buy surplus cranberries to help growers with the oversupply, seeking a repeat of similar purchases in 2014. 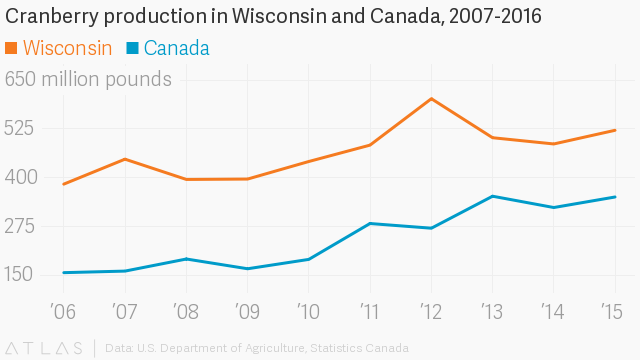 More broadly, this growing supply means a mix of opportunities and pressures for growers in Wisconsin. Tom Lochner, executive director of the Wisconsin State Cranberry Growers Association, and Jim Reed, chief executive officer of CranGrow Cranberry Growers Cooperative of Warrens, discussed the outlook for the tart fruit in a Jan.30, 2017 interview on Wisconsin Public Radio's The West Side. Lochner pointed out that the amount of land cranberry bogs use in Wisconsin really hasn't changed in recent years. Instead, the acreage already growing cranberries is getting more productive. He attributed that to farmers' use of new technologies and an increased interest in genetics and new cranberry varieties. For example, the association is working with the USDA and private funders to establish a new cranberry research facility. And even as growers produced a near-record crop, the 2016 growing season also brought warm and wet conditions that caused a lot of fruit to rot, Lochner noted. Though all farmers constantly face changing and unpredictable conditions, it's especially tough on cranberry growers, because they're basically stuck with a long-term investment in the form of their bogs. 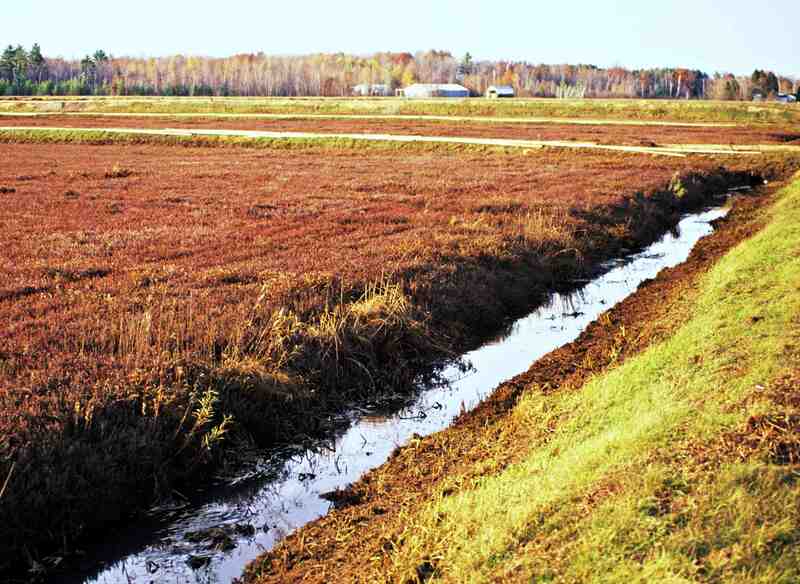 Unlike row crops like corn and soybeans, a cranberry bog isn't something a farmer can just dispense with and quickly replace with different crops. Cranberry vines are perennial and long-lived, producing crops over multiple seasons. "Once you've set up a cranberry marsh, that's what it is you have," Reed said. "We have marshes that have been in production continuously since the 1880s." Lochner and Reed discussed the abundant cranberry supply and how a surplus can drive down prices, but other challenges are much more local. For example, shortly after the Wisconsin Department of Natural resources reintroduced an elk herd in Jackson County in August 2015, cranberry growers started finding these animals in their marshes. Elk can eat quite a few cranberries, and their behavior can damage bogs. And as with most aspects of Wisconsin agriculture, understanding the export market for cranberries is crucial. Wisconsin currently exports 35 percent of its cranberries, compared to 5 or 10 percent a decade ago, Lochner said. Much of the growth has come from China, Reed said. He noted that nation consumes more than 9 percent of the world's cranberries today, compared to "next to nothing nine years ago." Some languages don't even have a word for cranberries, and just might like to hear about them. Reed recalled being on a recent Wisconsin Economic Development Corporation trade mission to India. "When I was in India, I sat in front of 26 different potential customers, and 20 of those people had never tasted a cranberry, and I'm talking about R&D- and CEO-type people," he said. Scientists are working to expand the variety of cranberries available for growers and consumers. By harnessing genetics to manipulate various traits - juice yield, sugar content, shape, color - more precisely tailored cranberry varieties can be grown to make the fruit more attractive to different uses people are demanding around the world. Amid A Boom, Wisconsin Cranberry Growers Look To Future Markets was originally published on WisContext which produced the article in a partnership between Wisconsin Public Radio, Wisconsin Public Television and Cooperative Extension.